Daniel M. Stroud, 52, of Columbia, was arrested for possession of cannabis and possession of drug paraphernalia at 2607 Columbia Lakes Drive. Stacey L. Anderson, 33, of Columbia, was arrested for DUI and speeding on Veterans Parkway at Admiral Parkway. An Illinois State Police crime scene unit was called in to assist with an investigation into parts stolen off several cars parked on the Weber Chevrolet lot at 701 Old State Route 3 over the weekend. Anyone who may have observed suspicious activity in that area is asked to call 281-5151. Jason McArthur was arrested for a St. Clair County warrant on Fountain Road. The report of four signs intentionally run over by a vehicle at Cedar Ridge Farms is under investigation. The theft of a leaf blower and weed eater from a garage in the area of 4800 J Road is under investigation. An attempted burglary that occurred shortly after 1 a.m. at the Monroe County Electric Cooperative main office at 6132 State Route 3 is under investigation. The fence was cut outside the facility. Other than a plastic chemical sprayer moved from its original location, nothing appeared to be missing. A subject believed to be a young white male was observed entering the grounds through the hole in the fence on video surveillance. Robert Antoff of Cahokia was arrested on a Monroe County warrant. 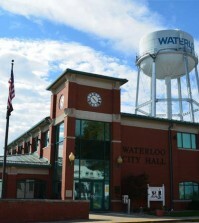 Lara J. Wuertz, 35, of Waterloo, was charged with resisting arrest after police were called to a report of a disturbance at 7923 Andy Road. Timothy W. O’Guinn, 37, was arrested for domestic battery in Hecker. Valmeyer Fire Department first responders and Monroe County EMS assisted at the scene of a one-vehicle rollover on East Woodland Ridge at Bluff Road around 8:25 a.m. The male driver, Michael J. Wise, was walking around outside the vehicle upon police arrival, and did not require medical transport. Gary G. Pieper, 63, of Columbia, was arrested for DUI on North Market at First Street.